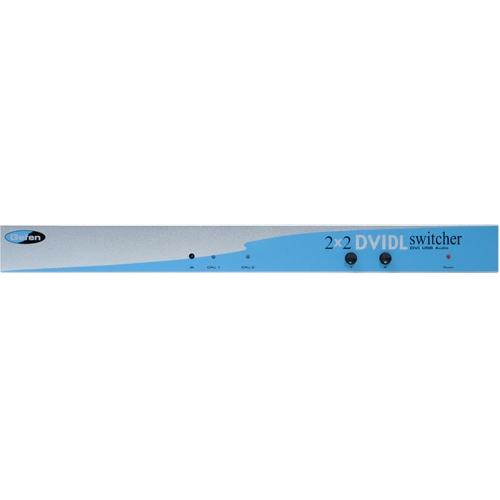 The 2x2 DVI DL DVI Switcher allows you to easily switch between two cross-platform extended desktop dual link DVI computers using just two dual link DVI displays, USB 2.0 keyboard and mouse. Dual link DVI uses all 24 pins of the DVI connector to achieve ultra high video resolutions up to 3840x2400. USB 2.0 is the next generation of USB, capable of sending data significantly quicker than before. Video and control signals are "switched" for each computer upon selection using the Discrete IR Remote and Discrete Contact Closure Remote (RMT-2x2), providing you with an easy and effective method of accessing two computers from one workstation without the hassle of networking.